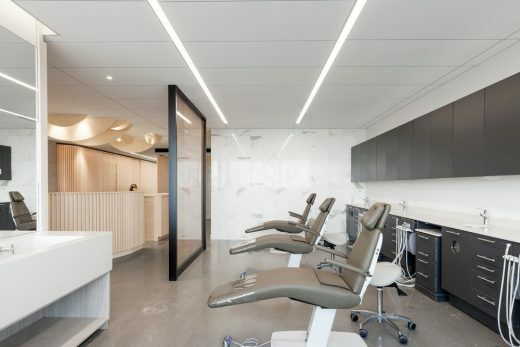 Located within a commercial complex, Go Orthodontistes clinic is accessible by a long hallway, which serves as a passageway between the exterior commercial complex and the carefully crafted universe that lies within. In order to create a cohesive space of total design, it was necessary to conceive the interior space simultaneously with the elements of industrial design. 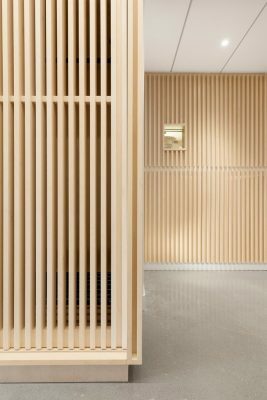 The wood slats inform all interventions and the open layout, with its curved surfaces and reveals, mitigates confusion, favouring openness. The open plan of the space naturally guides visitors, affording them visibility of the environment, putting them at ease. The spatial configuration addresses notions of public or private spaces by the degree of material opacity and visibility depending on the vantage point. 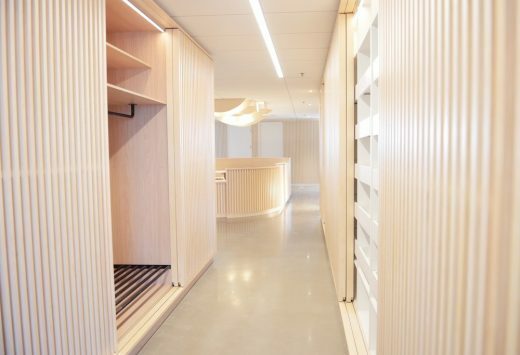 The long entrance corridor provides an opportunity to create essential storage space needed for a 1,943-square-foot office. One side of the hallway provides drawer storage for orthodontic appliances and the other, closet space. Surfaces of walls and partitions were treated in varying degrees of opacity. From the waiting area, the clinic is visible just beyond the reception desk. Dental chairs in the treatment area are hinted at behind a bronze mesh and glass panel. 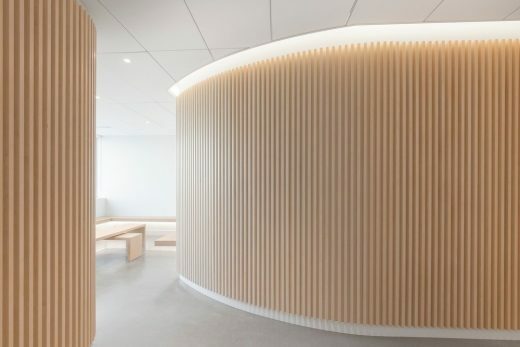 Private areas, such as the consultation room, are fully opaque. 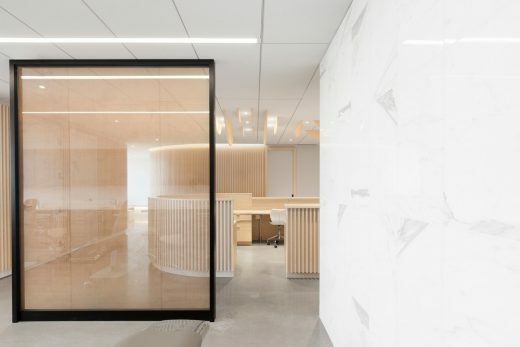 In some areas, the laboratory and instrument sterilization centre were treated with transparent glass with a translucent white film applied in zones for clinicians to work in semi-privacy. Noble materials were chosen for their durability, warmth to the touch, and ease of maintenance. All built-in furniture was designed for the project in conjunction with the spatial planning, creating a strong link between all elements. 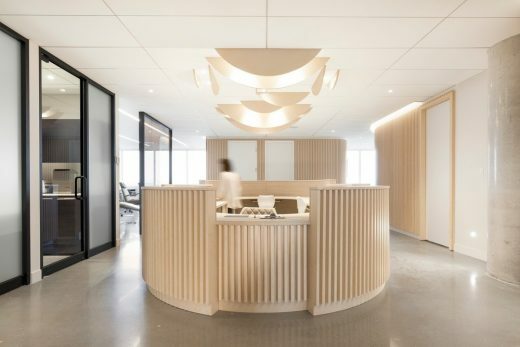 Items such as the light fixture, which abstractly spells “Go,” the family name of the doctors, create highly visual experiences. In designing a space focused on aesthetic transformation, colour connotations were critical. Cleanliness, purity, and comfort were paramount. The palette favours light natural tones that showcase noble materials at their best and put visitors at ease. The original concrete of the floor and columns was polished and left intact, preserving a link to the building structure. Variation and moments of drama are created through linear repetitions on walls and through finishes such as the Calacatta Oro marble. 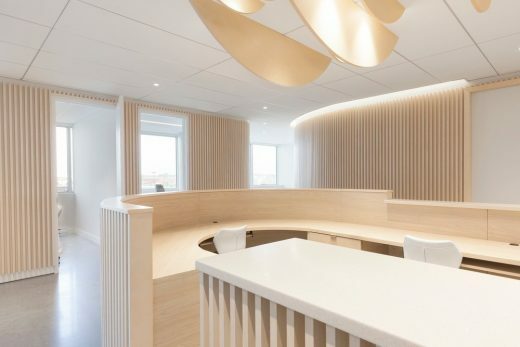 The following items constitute the built-in furniture: waiting room benches, cabinetry in private office, laboratory and conference room, reception desk and light installation, hallway closet and storage. 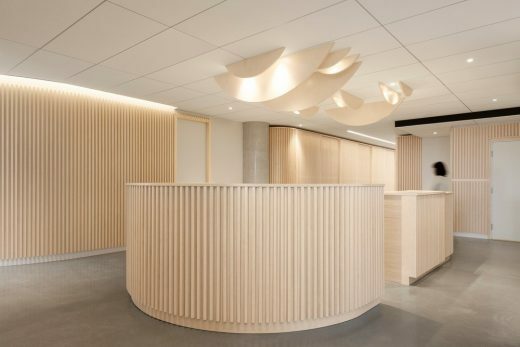 In the context of a clinic, sensitivity to visitor experience is essential, as feelings of anxiety are often present. The area most associated with fearful experiences in dental offices is often the X-ray chamber. 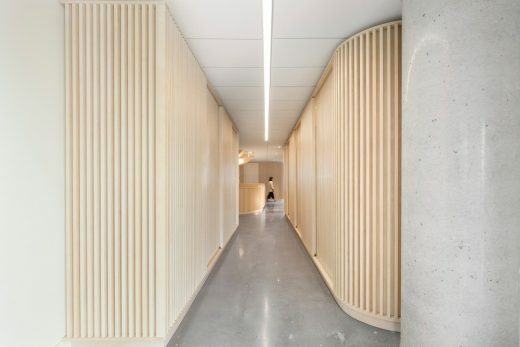 All interior surfaces of this small space were done in BC Fir in order to give a cohesive feeling in an environment that might have otherwise felt claustrophobic. 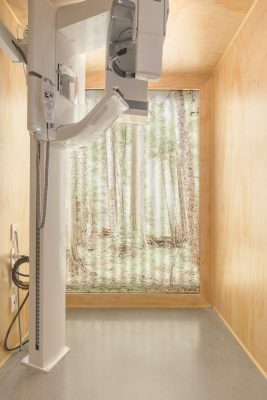 When placed inside the all BC Fir environment, the X-ray machine becomes altered by its context. It seems less scary and machine like. 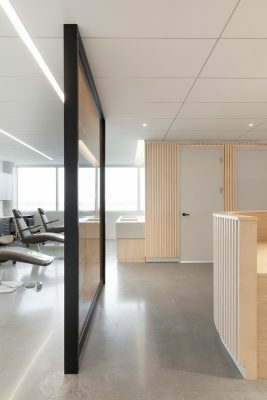 The waiting room area of this clinic is bathed in natural light and wall-mounted benches with low backrests, maximize space in the small area. Furthermore, no seat is turned with its back to the entrance which reduces apprehension. Long overlapping low tables allow for customized configuration and can be tucked one under the other in order to create more space. The satin finish of the wood captures natural light and LED under-lighting calls attention to the benches’ geometry, creating dimension. 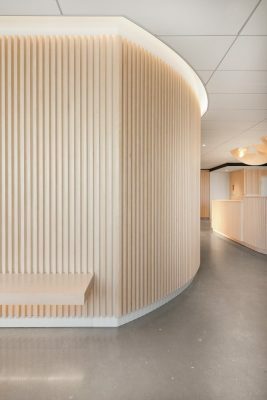 The wood used for the benches and tables in this waiting area is Russian plywood stained to the lightened tone found on all wood surfaces in the clinic. This type of wood was used for its rigidity and resistance to warping. Customized sinks were required to create cohesion with the clean linearity of the space. 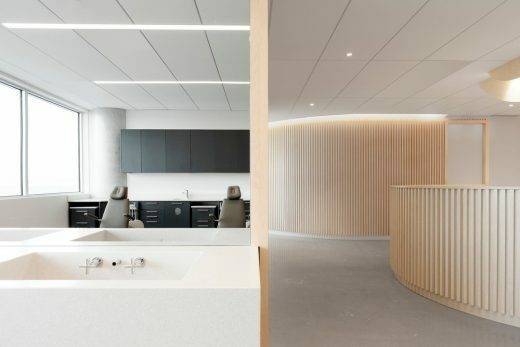 The sinks share materiality with countertops throughout the space, Corian, which creates continuity throughout the entire office. 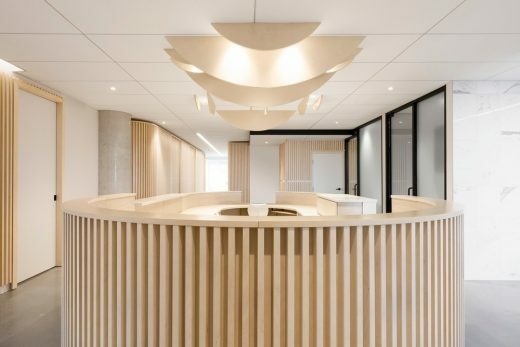 The reception desk was treated as a space in itself, without the constraint of closures. 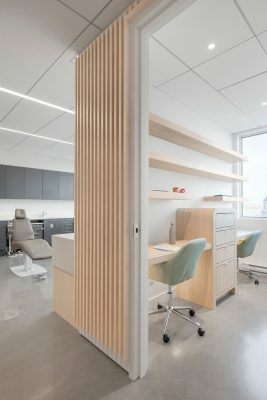 The notion of separating functions and privacy were addressed with the varying heights of the desk’s low-walled perimeters. 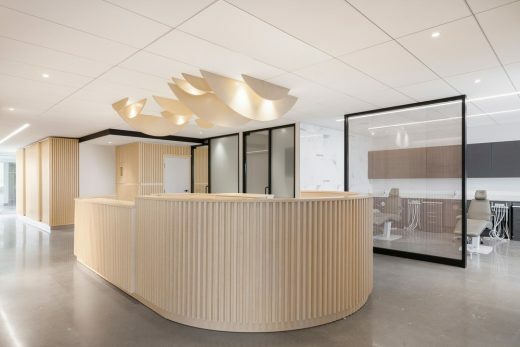 Go Orthodontistes Clinic Brossard was the recipient of three awards during the 11th edition of the Grands Prix du Design. 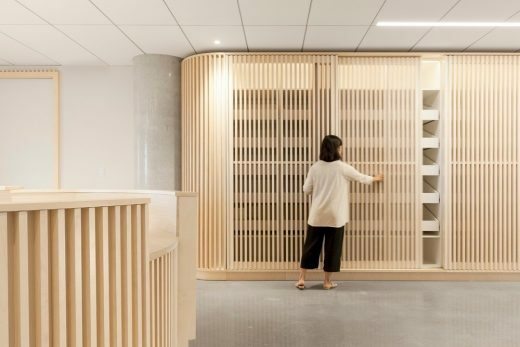 The prizes were awarded for: valorization of wood in industrial and product design, residential commercial or integrated design products in small series, and for a health office or clinic.